DESIGN, QUALITY, PERSONAL STYLE & SERVICE. Glamorous, elegant , classics with a twist, a handpicked carefully chosen selection from the world´s leading designers. International top designers,new brands, unique brands and exclusive brands just for you.Experience superior quality in various price categories and an edgier world of fashion for the sophisticated woman. We give you the luxury you can’t find anywhere else in Sweden and a higher level of personal service, expertise and quality – simply the kind of fashion women of the world have long been missing. The best for the best! The Fashion duo is back at home base, Stockholm, close to the heart and in its niche with a 24 hr Dressing concept for the modern woman. An elegant and glamorous mix of leading designers such as Azzedine Alaia, Alexander McQueen, Balmain, Ermanno Scervino, Jean Paul Gaultier, John Galliano, Roberto Cavalli, Sergio Rossi. In combination with jeans, knits and chic leisure and sportswear, a highly selective sample of the best from around the world. 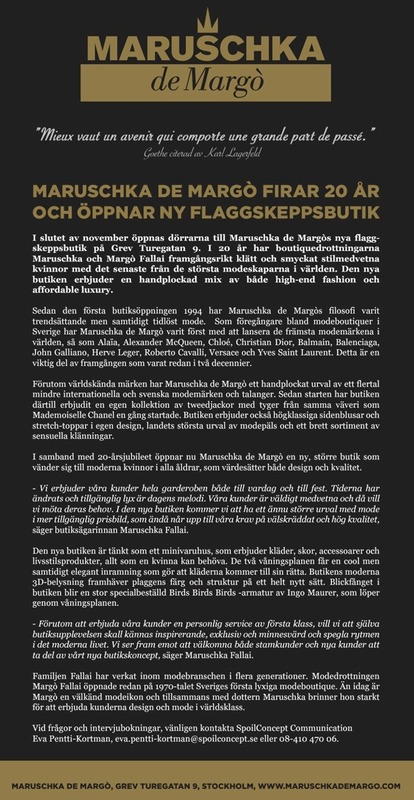 After 15 years of absence Margo and Maruschka returns to Sweden. In 1994 Maruschka the third generation of fashion profile opened her first store, which was backed by her legendary mother. Maruschka’s dreams of a life in fashion began already at the age of 6. After completing studies in France, Switzerland and the United States and with a Bachelor of Arts in business at Babson College she was the first to re-launch fashion designers such as Yves Saint Laurent, Roberto Cavalli and Christian Dior to Stockholm Fashion arena, with new names as DKNY, John Galliano and Hervé Leger. After major success with American brand DKNY, the Stockholm store is expanded to three floors, becoming the first flagship store in Scandinavia. Womenswear, menswear and sportswear departments share space with the much celebrated inclusion of a café and juice bar, along with customer entertainment in the form of fashion shows. An exclusive multi-designer boutique chain in which the main Italian and French designers in the sports fashion designer, and ready-to-wear launched in the U.S. market. After the success of Grand Fur Ltd since its entry into the company expanded Margo the Ready-To-Wear division and changing its name to Maison Margot. Ingrid & Knut Sjöblad, parents of Margó, gives Margòfree hands of the business to develop it in new directions. They were pioneers and were the first to introduce Italian and French high fashion designers such as Chloe by Karl Lagerfeld, Cacharel, Gucci, Pucci, and Fornasetti in Scandinavia. Ingrid & Knut Sjöblad Ateliers and fur specialists with a international customer base & suppliers mainly in Italy and France, Grand Fur Ltd were the first to introduce Italian and French designers such as Gucci, Emilio Pucci, Fornasetti and Cacharel onto the Scandinavian market. Our Tweed Jacket is chic, classy & with a feminine fitted silhouette. With impeccable attention to detail and unique style it can be worn as a suit, with a dress, classy trousers or a casual denim. Maruschka de Margo. Today we have 6 different models of jackets & 3 styles of skirts, all silk lined with handcrafted french buttons and hand wowen ribbons. Size range 34 - 46 & Individually Made to Measure. NOT FOR EVERYBODY. OUT OF THE BLUE. SOPHISTICATED.RICH. LUXURY.TIMELESS. ELEGANCE.QUALITY. SOFT AND FEMININE.